Working professionals who aim higher are finding support and success in the accelerated Bachelor of Arts in Social Sciences (BASS ) program at Stan State campuses in Turlock and Stockton. A group of recent graduates completed their degrees at the Stockton Center while holding jobs in the San Joaquin Human Services Agency (HSA). Through the year and a half-long program, Lovick said she realized working with kids was her passion. “There were a couple of professors I had that showed their love of teaching and it was their example that led me to this conclusion,” she said. Teaching 3rd or 4th grade became her ultimate goal. Andrea Resendiz, a bilingual eligibility worker, hopes to use the education gained at Stan State to advance in child-centered services in San Joaquin County. “I am a people person and I take pleasure in helping those in need. What I enjoy most is the fact that I have the means to make a difference through the work that I do. There are many families that are experiencing financial hardships and language barriers. Knowing that my job helps those in need brings me the most joy,” she said. A native of Mexico, Resendiz came to the United States at age 6 and had planned to be a teacher. She completed two years of traditional college at Stan State before a family emergency called her back to Stockton, where she held a series of jobs before finding her niche in the HSA. The Stockton BASS program, close to home and designed for working students, was the best educational fit for her. “The BASS cohort program is an awesome opportunity for working individuals to obtain their degree. The class schedule is what was the most appealing to me. I loved that the classes were in the evenings,” Resendiz said. Che Edmond, a staff analyst at the HSA, has set her sights on moving up the administrative career ladder at the agency, a goal that requires higher education. Her bachelor’s degree in hand, she plans on pursuing a master’s degree in public administration. Time commitments narrowed the list for Edmond. “The BASS program was very appealing to me because it is an accelerated program that offered classes after my work hours. I had been searching for a program such as this for the past 6 years. There are a few to choose from, but the BASS program is so much more affordable than the others,” she said. For Lovick, the big draw was flexibility. “I wasn't quite sure where I wanted to be professionally, but I knew that helping others is what brings me the most joy professionally and personally. This degree fits the requirements of a wide range of professional degrees and I knew it would provide a good basis for whatever I eventually decided on for a graduate program,” she said. 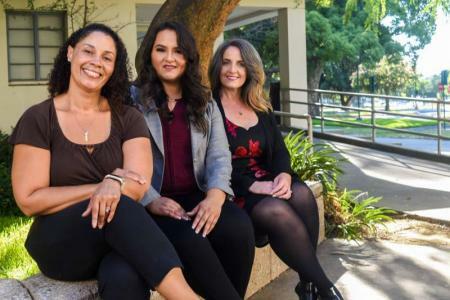 All three women saw a university degree as critical to career advancement, with the accelerated program offering a manageable way to achieve it. The BASS program includes courses in sociology, communications and political science. Its classes focus on human social interaction, discussing contemporary social problems, their causes and potential solutions. The program is designed to last 17 months, comprised of a mix of face-to-face classes and self-paced online courses. “The BASS program is accelerated, so you have to prepare to be busy with research, homework, writing and studying,” Lovick said. Reaching out to the others in her cohort helped her through. “Those relationships provide the support you need when you aren't sure you are going to make it,” she said. The program is offered through the University’s Extended Education office. Students work in cohorts, which offer the benefit of peer-to-peer support.